We don’t generally use the blog to promote the editors, but this rather nice review of EU Law for UK Lawyers by Aidan O’Neill QC appeared in the Journal of the Law Society of Scotland and we thought we would share it. 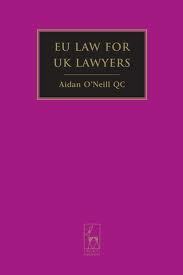 The book is available at all good legal bookshops and online. In a legal world where specialism is seen as an end in itself, it is refreshing to have an author consider one supposed area of specialised law and demonstrate its relevance, influence and direct impact on individuals’ rights and obligations across all areas of practice: civil, commercial, criminal, employment, competition, planning, intellectual property, taxation, public procurement, health and safety, and more. O’Neill anchors his belief that EU law needs to be read “in a manner which is informed by fundamental rights” by referencing each area of practice to the relevant provision of the Charter of Fundamental Rights. This is a compelling text and at this price is worthy of being in all practices. This entry was posted in Current Events and tagged Aidan O'Neill by eutopialaw. Bookmark the permalink.